Charles Doyle with his father, Jon; his mother, Shih Hua; and his little sister, Sonia. Charles Doyle is one of the most committed juniors taking lessons at The Bridge Golf Learning Center, and he has had quite a bit of success in local golf tournaments. 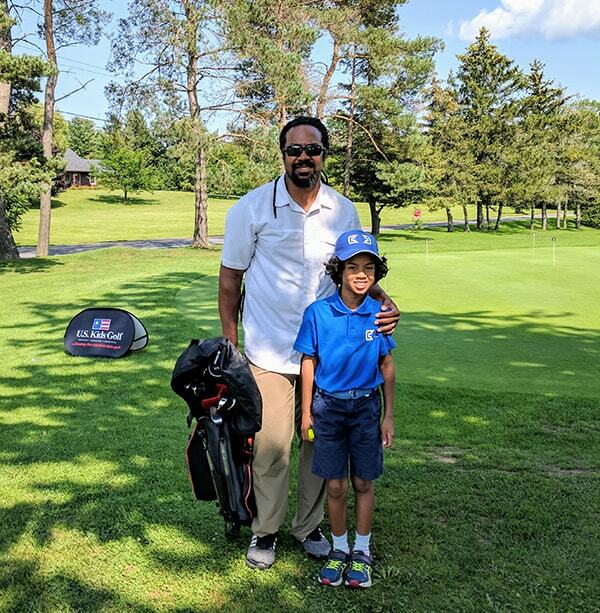 His father, Jon, recently fielded some questions from Executive Director Farrell Evans about Charles’s progress as a junior golfer, the impact Teaching Professional Randy Taylor and our Learning Center have had, and Jon’s new role as a caddie-dad. 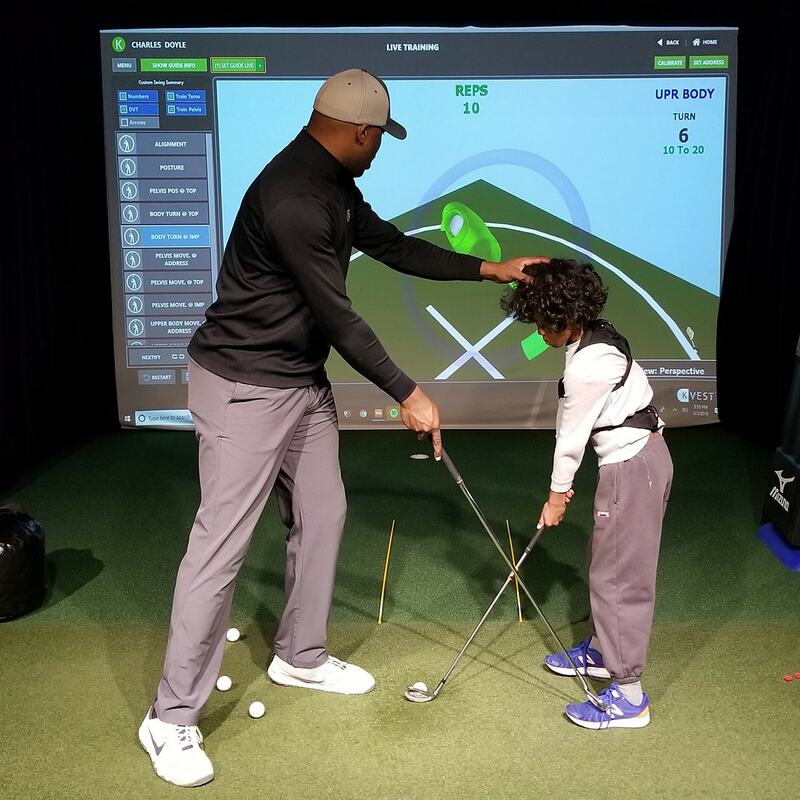 FE: Your son 8-year-old son, Charles, who has been a student of Randy Taylor’s at The Learning Center since we opened in 2016, is now playing junior golf tournaments. How did your family decide to enter Charles into events? JD: Prior to golf, Charles was a nationally ranked scholastic chess player for 4 years. He always has a desire to compete in general, so we knew he’d eventually pursue golf as well given how much he enjoyed the lessons with Randy at the Learning Center and his quick learning curve. At the end of the summer of 2017, after a year of lessons, we noticed a big jump in the consistency of his ball-striking and wanted to see how he would do in competition. In his first U.S. Kids Tournament as a 7-year-old, he shot 51 and finished in fourth place. Jon has been on the bag for Charles during his tournaments. FE: What role do you play for Charles during the tournaments? JD: During tournaments I am his caddie. The more tournaments we’ve done, the better I’ve gotten at helping him make adjustments during a match and helping him play each course as strategically as possible to maximize his strengths. Beyond yardages and putting speed, in this past season I’ve worked really hard on green reads with Charles and understanding the courses as much as possible before he plays them. FE: How do practice and lessons in the Learning Center help prepare Charles for tournaments? JD: The Learning Center has been instrumental in providing a year-round facility for Charles to improve his swing and putting stroke with Randy. The real-time feedback from TrackMan, K-Vest and the putting analysis at the Learning Center has been invaluable and has really allowed Charles to get to where he has in the last two years from scratch, basically practicing golf once a week. 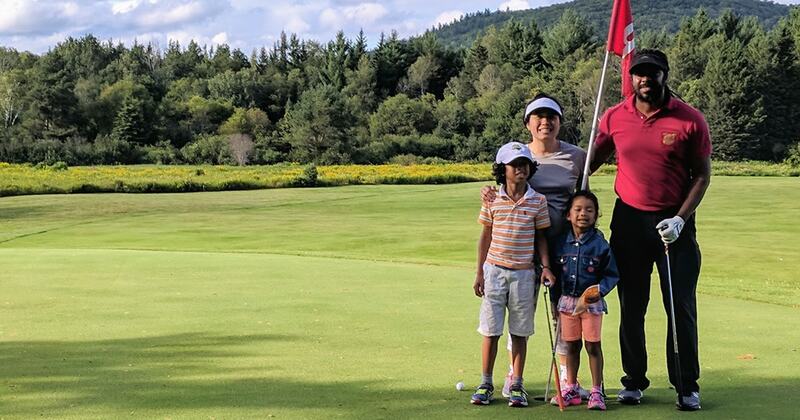 Many of the kids he competes against in tournaments have had a golf club in their hands since they could walk, or have backyards where they can practice chipping and putting, or have a parent who is an avid player. They are often in their third or fourth year of tournaments. The year-round practice facility that the Learning Center provides has been crucial to getting him up to speed in a shorter period of time. The Learning Center really levels the playing field for kids who live in a New York City apartment and are passionate about the game. There’s no way Charles would have achieved this early success if there wasn’t a Learning Center. Looking back, it was quite serendipitous that we saw the balloons outside the Learning Center after a Saturday swim class in the spring 2016. Charles has taken his game outside for U.S. Kids Golf tournaments. FE: What are the strengths and weaknesses of his game? JD: On the mental side, his ability to focus and quickly put what he’s learned from Randy into practice is very good. On the physical side, his greatest strengths are the things that he can practice indoors at the Learning Center; his putting and consistency with ball-striking are pretty solid in optimal conditions. He’s also on the Children’s Aid Society Stingrays, a swim team that practices across the street from the Learning Center, which has really improved his overall fitness and strength and has allowed him to increase his yardages with his driver, woods and irons. His weaknesses are things that happen all the time in golf but can’t easily be practiced indoors, such as hitting out of bunkers or in the rough, or balls below or above his feet. Since all U.S. Kids tournaments are set up on full-length courses, it is fairly common to have tee boxes in the rough or in fairways that are rarely level. Weather is also a factor and makes things interesting. At the first North Jersey tournament in the spring, the temperate was 32 degrees. At Dunwoodie during the summer tour, he played at times in a complete downpour. FE: It’s been more than 25 years since I played junior golf. What’s the atmosphere like with players and parents at these junior events? JD: In general the atmosphere is pretty good, and the tournament directors have done a good job of pairing more experienced players and parents with less experienced ones to help them out. We’ve done three complete U.S. Kids tours now (Hartford in the fall of 2017, North Jersey in the spring of 2018, and Long Island Sound in the summer of 2018), and they’ve all been solid and positive experiences. FE: Has anything surprised you about the culture of junior golf or the skill level of the kids? JD: The skill level of the top kids is really amazing, and I personally wish that I had been exposed to golf at the same age Charles was after seeing some of them play. The great thing about golf is that the kids with the best short games and putting skills are the ones who tend to do the best. Often these kids aren’t the biggest or strongest, but they have great touch on approach shots and are able to execute consistently and recover from errors. Culturally the level of sportsmanship is the highest of any organized sport Charles has taken part in. It’s been really refreshing. FE: How many tournaments did Charles play this season, and what was his best finish? JD: On Long Island this summer, he competed in eight tournaments through July and August. He finished in first place twice, second place three times, and third place three times, which was good enough to make him the overall tour winner. His scoring average was 45 and his best rounds were 41 at Forest Park in Queens and 42 at Putnam National in Mahopac, NY. In North Jersey in April and May, his scoring average was just under 50 over six tournaments. FE: What do you hope he gains from this experience? JD: Our first goal for Charles and his younger sister is to always be a good person. The core values of golf that he’s learned so far at The Learning Center, U.S. Kids Golf, and The First Tee have really helped to reinforce that on and off the course. In life as in golf, not everything works out as planned, but through perseverance and hard work he’ll eventually get to where he wants to be. Golf is similar to chess in that it is important to think before you act and put effort and focus into each swing/chip/putt. The impact of that stroke or move can have positive or negative results down the road. Working with Randy Taylor and K-Vest at The Bridge Golf Learning Center. FE: What are his goals for next season, and how much will he practice over the fall and winter? JD: Now that Charles has achieved “Burgundy Priority Status” with U.S. Kids Golf through his Long Island Sound tour victory, it relieves some of the pressure. He will play as a 9-year-old in the fall and next summer, and the score target drops from 44 to 42, but the yardage of 1,900 stays the same. In the coming fall season we’re thinking about doing the Central Jersey Tour, but he will only be able to participate in up to six of the seven events, which puts him at a disadvantage points-wise to win the tour. So the real goals are to lower his scoring average and focus on shooting at or better than the new score target of 42. With his priority status, he also qualifies for the U.S. Kids World Championship in Pinehurst next summer, along with other U.S. Kids regional and state invitational events. We’ll definitely go to Pinehurst, and then we’ll see if there’s any budget left for any multi-day regional tournaments. 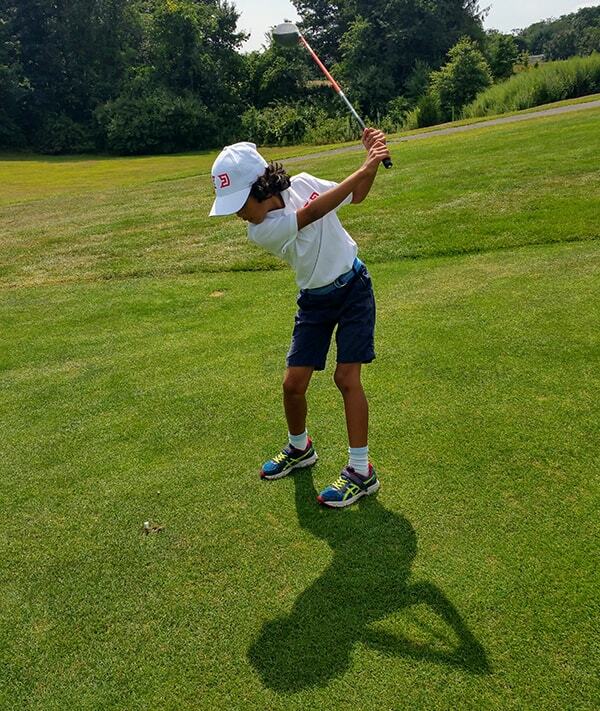 In an effort to get him as much on-course playing time as we can, he is also doing the PAR practice and play program through The First Tee at Mosholu in early fall, and then he’ll be working with Randy once a week from late fall through early spring at The Learning Center. We’ll also pop in from time-to-time after his swim team practices if he still has any energy.